Oct 28, 2014. A father and young adult daughter presented this gentle 7-year-old male Sheltie for dental scaling. A friend's Maltese had died after dental scaling by another vet and so the owners wbeere worried about anaesthetic death. "Dogs usually do not die under anaesthesia or after anaesthesia," I said to the father. "Unless the dog has heart disease or poor health." A thorough physical examination showed that this Sheltie with bad breath was generally healthy in heart and lungs. The heart beats were irregular. 50% sedation of domitor and ketamine IV calmed this nervous Sheltie. Health screening including a complete cell count and X-rays of the chest is advised. No ECG is done. In this case, I gave an IV drip, with IV baytril, frusemide and Vit B complex. It is very important to provide a very close monitoring of the maintenance of isoflurane gas at 0-2%, oxygen flow rate at 2 litres/minute to ensure that minimal anaesthesia is being given. 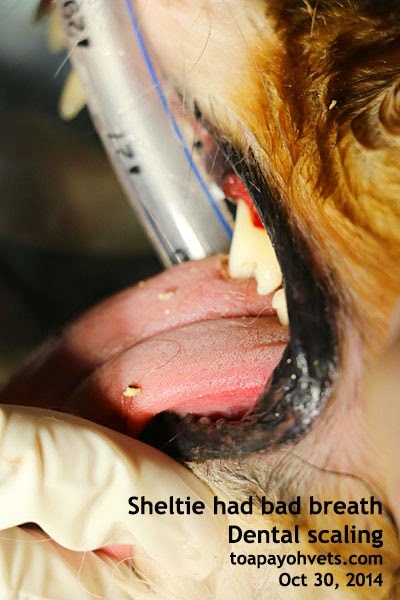 The dog did wake up in the midst of dental scaling as the maintenance dose was 0.5%. He was intubated again and maintained at 2%. The dog woke up fast and went home 3 hours later. Follow up 2 days later showed that the dog is OK. The dog had been given dry dog food and milk since young. He likes only certain brands of milk. Well beloved family dog and in excellent body condition. A new client - father and young adult daughter brought in a 7-year-old male entire Shetland for dental scaling. Their friend's Maltese had died after dental scaling in another vet practice and so they did not want to go to the practice. No vet can guarantee no anaesthetic risk. Even people do die. Other than periodontal disease grade 4 (tissue attachment loss over 50%), I noted that this Sheltie had congested maroon red gums, not the normal pink ones. You can see this in the video. Why? The capillary refill time was longer than the usual 2 seconds. Blood test showed that this dog had a higher than normal amount of haemoglobin in his blood at 19.1 (12-18). The total red cell count was normal. The haematocrit was normal too. Platelets were normal. What does it mean? Was he fed some supplements? All the other blood values within normal limits. The dog was a bit tired yesterday but is Ok and eating today. "Tartar started to build up fast in last 3 years," the father said that the dog was not given meat. "Could it be the milk making the kibbles soft?". This dog had the biggest crusty tartar I had ever seen in a dog (see image/video). The dry dog food was Science Diet Lamb and Rice with a brand of dog's milk since young. Dog treats were given. No milk and treats to prevent tartar build up. Eat dry food without milk and drink water. Blood test 4 weeks later to check on the urea levels. This case shows that a blood test is important for screening the health of an older dog. The owner was given the option. The blood test was done by me as this dog had an unusual congested gums.